It took me a while to finally notice this. Mali owns the travel agency that I've used to arrange my trips around the Angkor Temples and Siem Reap, so I'd been in her office many times. You’d think I would've noticed before that her legs were different colors, since she walks around her office in a skirt, barefoot. Like other Khmer’s, Mali's skin color is darker than most Asians. The exception is her left leg, with a lighter tone. That’s when I realized that this was not her real real leg. It’s a prosthetic. Mali lost her leg to a landmine. You’d think this would be a sensitive subject, but she had no problem telling me all about it. In fact, she was quite proud to show off her prosthetic leg to me. The injury had happened many years back, when she was 18. She was on her way out to work the farming fields. She was just walking along the side of the road, and that’s when it happened. She stepped on a mine, and the explosion threw her 30 feet. She lost her leg below the knee. That was years ago, when she used to live in Anlong Veng. When Mali mentioned Anlong Veng, that perked my ears up even further. 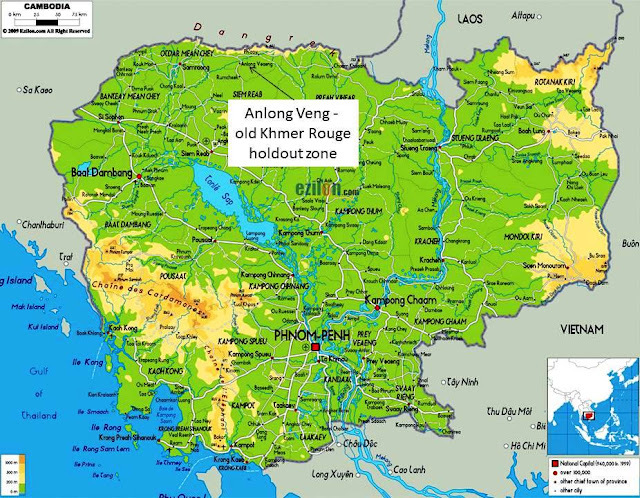 Further north, Anlong Veng was one of the last strongholds of the Khmer Rouge during the war years. "Was your family in the Khmer Rouge?" I asked. "Oh, yes," she said. "You see that picture there? My father was commander in Khmer Rouge." Up above a cabinet, was an enlarged photo of her father. He's a big, imposing looking Khmer. Half of his left arm is missing, so I asked how he lost it. "He lost it fighting, in 1970," she answered. In the photo her father wears a blue sash; the type government officials wear for special occasions. He's standing next to none other than Hun Sen, the current Prime Minister (dictator) of Cambodia. Hun Sen is also an ex-Khmer Rouge commander. I quickly see her resemblance to her father, except that he lacks her smile. In the photo, he wears a very serious face, while Hun Sen smiles at his side. The picture was taken at a government function. Apparently, as part of the peace agreement in 1998, the Cambodian government allowed many Khmer Rouge commanders to keep control of their zones of control, as long as they laid down their arms to join the government. Given his Khmer Rouge past, her father was probably a war criminal, and should be in jail for life. But like most former Khmer Rouge commanders, he remains untried, and unconvicted of his crimes. Instead, Mali’s father holds a senior position in Anlong Veng's provincial government. That's Cambodian politics. Given her father's Khmer Rouge history, I now had to ask her the million dollar question. "Did you ever see Pol Pot?" I asked a bit nervously. "Yes, many times. I saw him almost every day. I brought him food." Not only that, she even did his laundry sometimes! I show no reaction, but inside I’m absolutely stunned. I’ve just discovered that this sweet, lady travel agent was part of history. She had long term contact with one of the worst butchers the world had ever known. Not only that, she had lived to talk about it. It’s as though I’m speaking to Hitler’s maid. There had been more than one assassination attempt on Pol Pot, including in 1976 when some KR cadres tried to poison his food. One of his guards died instead. Given that event, he must have had a great deal of trust for Mali and her father. Since he ordered the deaths of so many close to him, she’s very lucky to be alive today. I continued my questioning. "Was he nice to you? Was he mean?" Since I was asking about a genocidal leader, her answers were not what I expected. "He was a simple man," she said. "He was gentle." More like simply evil, I think. I suppose Pol Pot may showed a kinder side of himself to Mali, than he did to others, since she cooked for him. Her opinion of him surprises me. “I know he was cruel,” she says, “but he could also be generous.” She says that he saved her family. She does have a point. Years before, when the Vietnamese Army was closing in on their position, they killed every Khmer Rouge they could find. 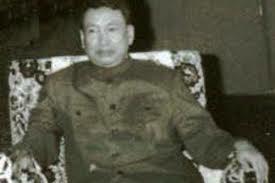 Pol Pot was responsible for protecting 20,000 people, including her family, from their wrath. Fortunately, Mali never had to be a soldier. There were few female Khmer Rouge fighters, and her father had influence to keep her out of the ranks. Not all of Mali’s family survived those years. Her mother and three sisters managed to survive, but not her younger brother. He died at the age of seven. "Fever and poison," are the reasons Mali gives for his death. It may have been malaria. Mali eventually married a Khmer Rouge cadre. Not surprisingly, their marriage didn’t last. After having one daughter, they divorced. Mali has been through so much. She lost a leg. She lost a young brother. She lost her husband. For some years, she even lost her country, and lived in refugee camps. I’m amazed at what a survivor Mali is. Perhaps her father was within Pol Pot’s trusted inner circle. Still, many of the people that ‘Brother Number One’ said he trusted, ended up dead in Cambodia's killing fields. Yet, I look at her now, and she’s strong. She’s capable. She walks on her artificial leg, without a limp, and without complaint. She runs a thriving travel business. She speaks Khmer, English and Thai that she learned as a young refugee. She’s a single mother, and takes good care of her daughter, ensuring that she receives the education that war denied her. Her father's guilt is not being passed on to her anymore. The Khmer Rouge are gone, and she’s doing well now. After all she’s been through, and with all that she’s survived, she deserves the better life that she has now.